Hong Kong is much more than a global financial center, and if you need any further proof of that fact you need to visit here in the month of March. For whether you live in the USA or here in Hong Kong – the end of March signals one thing – March Madness! The US version of March Madness focuses on NCAA collegiate basketball and runs for 3 weeks. The Hong Kong version of March Madness takes only three days when the city hosts the premier rugby sevens tournament – the Hong Kong Rugby Sevens. It’s an action packed weekend, on and off the playing field (pitch). This year a record number of teams – 28 men’s teams in total – played a record 70 matches in just one weekend. Rugby sevens is a fast-paced version of traditional rugby, with most games lasting no more than 15-20 minutes (two 7-minute halves). With only seven players per side on the field at a time, quickness, discipline and tackling skill are important keys to success. But if you have ever attended the Hong Kong Rugby Sevens tournament, then you’ll know that for many people it’s about more than watching the rugby games. The Hong Kong Sevens has earned a reputation for its carnival-like atmosphere in the stands, where fans not only proudly wave the flags and colors of their home or adopted country, but they also try to dress up in the most outlandish outfits and costumes for the weekend. Expats from all around Asia and as far away as Great Britain travel to Hong Kong just to be part of the excitement – and it makes for a very international-flavored weekend both in the stands and on the field. If the games ever get slow or too boring (not likely! ), you can always watch the antics of the fans in the South Stands (known for their creative attire and raucous behavior) – never a dull moment there! This year’s tournament was not only about winning one of the four trophies handed out (1st tier – Cup; 2nd tier -Plate, 3rd tier – Bowl and 4th tier – Shield), but it took on greater significance as teams are looking ahead to the 2016 Olympic Games in Rio, where rugby sevens will make their debut (do you know the last time rugby was an Olympic sport?). The teams seemed more evenly matched this year, as evidenced by three of the final four games: Shield Final – France (19) Argentina (14); Bowl Final – England (42) Hong Kong (7); and Plate Final – Samoa (12) Canada (7). The heavily watched Cup Final featured returning champions Fiji up against a young and dynamic team from Wales. With Wales jumping to a quick 19-0 lead by the end of the first half, the Hong Kong stadium roared in anticipation of an upset for the mighty Fiji team. But from the start of the second half, Fiji showed their experience as they forced the younger Wales team into turnovers and penalties. They tightened up their attack and half way through the second half the match was tied at 19-19, with Fiji getting the winning try in the final minutes to win the game 26 – 19. Not to be outdone by the men, Hong Kong also hosted a women’s rugby sevens tournament this week as well, with Canada soundly beating Australia in the final game 29-0! We decided to stay home and watch the games in the safety and comfort of our apartment this year, as one of the local TV stations broadcasted the games live. At least they did that up until the penultimate moment of the Cup final between Fiji and Wales. With the game tied and both sides pressing for the winning try, the live broadcast was cut off as the local TV station began their evening news report! 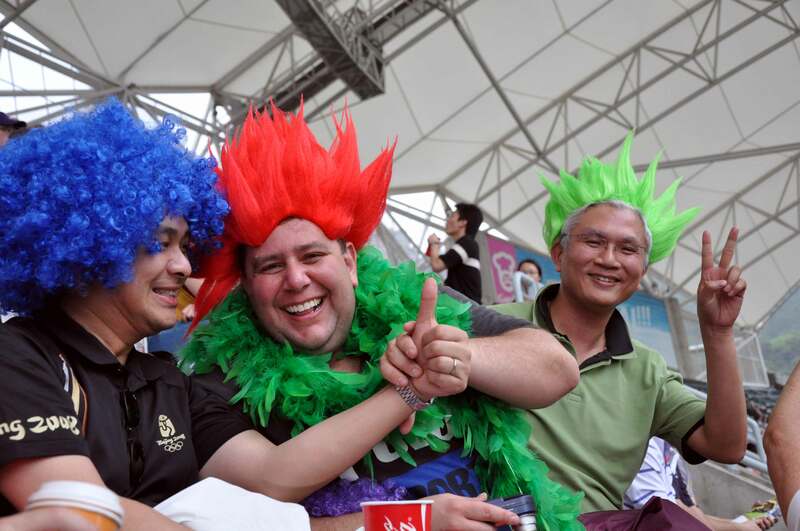 By the time we found the web site for the Hong Kong Rugby Sevens, the game was already over – lessening our excitement a bit for this year’s grand finale. The anticipation of rugby sevens at the next summer Olympics has only increased excitement for next year’s Hong Kong Rugby Sevens – we’re expecting it’ll be another thrilling weekend for all who attend. In light of that possibility, we may need to start booking our tickets for next year – anyone interested in joining us for some March Madness – Hong Kong style? In the pursuit of sharing some insights into the city where we now live, I thought I could use some statistics to give you a glimpse into Hong Kong. There were many different areas I could have researched and mentioned here, but I came up with a list of 6 factors that I believe are somehow all inter-related. Hong Kong is not a large place area-wise, and isn’t all that populated compared to many other major cities in the world. But when you put the two together – 7 million people living on 407 square miles (1,054 sq. km) of land mass, it makes for one of the most densely populated countries in the world. That means there is an average of 18,000 people per square mile, compared with Canada (9 per sq. mile) USA (84 per square mile). If you are a little bit claustrophobic you might want to prepare yourself before coming here for a visit! You’ll especially notice this when you get up close and personal with all the other people riding the elevators with you. So it makes sense that in a city where land is limited, you will need to build taller buildings in order to meet the demand for office and living space. Hong Kong continues to hold the # 1 ranking as the city with the most skyscrapers – for the 6,593 high rise buildings (100 meters / 25 stories or taller) and for the 1,316 skyscrapers (200 meters / 50 stories or taller). All these skyscrapers make for a wonderful view over Hong Kong’s Victoria Harbor – but at what point will they run out of land on which to build these impressive buildings? One of the latest proposals for dealing with housing needs in Hong Kong is something called the Bionic Tower, which if it is built would be 300 stories high and house 100,000 people. With land at a premium, most families are unable to afford to buy a single-detached home, and instead live in one of the many multiple residential dwellings scattered around Hong Kong. But it doesn’t come cheap – whether it’s buying an apartment or some other form of residential real estate, Hong Kong has one of the highest home prices per square foot . A recent report had Hong Kong ranked as the city with the second most expensive real estate – an average of $4,570 – $5,050 USD per square foot of property. When compared to the most expensive city in the USA (San Francisco – an average of $421 USD per square foot) it’s no wonder that a high percentage of people in Hong Kong live in apartments smaller than 700 square feet in size. If the place you live in is relatively small in size, you probably won’t want to spend a lot of time there. But in order to get wherever you want to go – work, school, shopping center – you need a way to get there. 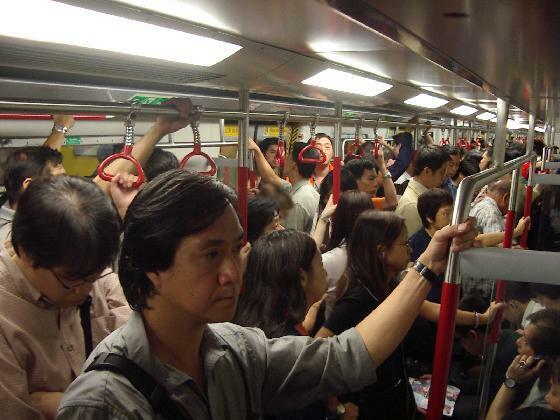 Most people in Hong Kong do not own their own vehicle, but rather rely on public transportation to get around. I believe that Hong Kong has a world class transportation system – with more than 11 million passenger journeys made every day on either railways, trams, buses, minibuses, taxis or ferries. The centerpiece and probably most frequently used of transportation here is the MTR/KCR – subway/train system with 82 stations covering 108 miles of track. In 2012 it was ranked as the 10th busiest subway in the world – 1.444 billion riders in 2012 – an average of 3.96 million people per day. Again, if you are little bit claustrophobic, I wouldn’t recommend riding the subway here during rush hours – it can get a little crowded! Many of those who use public transportation on a regular basis are students, as they make their way to one of the primary, secondary and post-secondary schools scattered across Hong Kong. Education is highly valued in Asia, and Hong Kong is no different. There is much pressure on students to excel at their studies, and a good amount of their time is given to education. Recently primary students in Hong Kong were recognized for their academic prowess, ranking #1 in the world for reading/literacy, # 3 for math, and #9 for science. And if that wasn’t sufficient to swell the heads of most Hong Kongers, then a recent (but yes, controversial) study has Hong Kong ranked #1 with the highest national IQ – (107). You would think with all these high rankings and accomplishments that Hong Kong would be a happy place. In spite of the fact of being one the world’s top three financial centers and ranked #1 for global competitiveness, it was only the 70th ranked city for worldwide quality of living. The most recent Satisfaction With Life Index, that included Hong Kong in their report (2006), showed that people here weren’t quite as satisfied with life as a lot of other countries – Hong Kong was ranked #63. So maybe it goes to show that being # 1 in economic and academic endeavors doesn’t always lead to happiness, and that a city is more than just all these facts and figures – there needs to be more than just these factors in place to bring meaning to life and to individuals within a city. In the end, Hong Kong will be assessed by more than all of its accomplishments and world rankings. As someone once wrote, “Life it is not just a series of calculations and a sum total of statistics, it’s about experience, it’s about participation, it is something more complex and more interesting than what is obvious.”1 Whether you come to Hong Kong for a short visit or stay for a longer time to work, we think you’ll find it to be an amazing city – come see for yourself! Thank you for your prayers for Debbie’s dad. We are thankful that he seems to be making some progress in the past two weeks, but PRAY for continued strengthening and that his one eye (re-attached retina) would continue to heal. PRAY that Debbie’s brother and his wife would have wisdom and discernment for the decisions they are required to make as the primary care givers for Debbie’s dad. Joel will be traveling to Guangxi this coming week (March 11-18) to meet with church leaders in three key cities. PRAY for wisdom and discernment as he talks with them about various church construction and leadership training related projects and has the opportunity to share with them on a deeper more personal level.